Woodside was first mentioned in 1332, one of the older settlements in the area. It is likely to signify 'at the side of the Great North Wood', which gives its name to Norwood, London. Woodside was largely agricultural land, but its heavy soil enabled a brick-making industry to form from 1815. Handley's brickworks' chimneys dominated the area, their hooter being heard all over the locality at lunchtime to signify the start and finish of the rest period and following their closure in 1974, a new open space known as Brickfield Meadows serves the community. Handley's sold out to Hall & Co who were subsequently taken over by Ready Mixed Concrete prior to closure. (There were two other brickyards in the group - at Newdigate and Ashford - the managing director Jack Milsted was also Founder Chairman of Croydon Amateurs FC from 1953 until 1990 when the club was known as Croydon FC. Croydon Racecourse opened in 1866 on nearby Stroud Green Farm, now the site of Ashburton Community School, closing in 1890. Woodside station was built to serve visitors to the racecourse in 1871. The station was served by the Woodside and South Croydon Railway. It is now served by Tramlink with services to Croydon and the London Borough of Bromley. 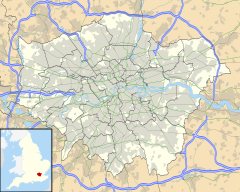 Woodside is part of the electoral ward of Woodside, one of 24 of the London Borough of Croydon, which covers a wider area up to Norwood Junction railway station, including South Norwood Country Park. The area identifying primarily as Woodside has gradually shrunk with most living within the SE25 postcode now terming themselves 'South Norwood'. Canning and Clyde Road Residents Association and Friends. (2000) The Book of Addiscombe, Halsgrove.